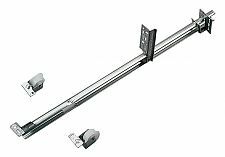 This center mount slide is designed for medium duty use in kitchen cabinets and bathroom vanities. High density polyethylene rollers provide smooth operation and maximum reliability for a lifetime. To ensure long lasting, smooth operation, the steel slide is finished in rust resistant precoated zinc. Features: Mounts with staples or screws. 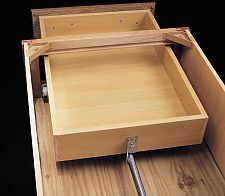 Drawers lift out for easy removal.